Should the Yankees Pack It In? Jobu ponders what direction the Yankees are heading in in 2013. That’s a tough question for a lot of Yankees fans to ask out loud. We are not a fan base that is used to floundering. Unfortunately, that’s exactly what the Yankees are doing right now. Although no one should be surprised, what with the injuries and roster mismanagement that has gone on this year, it’s still unnerving to know that the Yankees probably don’t have what it takes to win most games this year, let alone the American League East, Wild Card or even a playoff series. As a fan, what do I want them to do for the rest of the year? The front office has two options. They can either try to land some key players in trades to somehow help this offense get runs on the board, or they can tank all-together and trade away some impending free agents and expendable players to try to rebuild a little bit (or at least free up cap room for some free agency splashes). Both of these strategies have a lot of implications, so let’s take a look. Right now, the Yankees are weak at third base, shortstop, first base and catcher. Guys like David Adams, Jayson Nix, Chris Stewart and Lyle Overbay have filled in and done the best they can, but it hasn’t been very good. A team can afford to carry one of these types of fill-in players, but when you have four or five in your lineup every day (not to mention Vernon Wells), it becomes nearly impossible to win unless the pitchers totally shut down opposing offenses. The Yankees pitching has been overall very good, but it’s tough going into a game knowing that you can’t afford to give up more than a few runs or you’re going to lose. It’s not fair. To this end, the Yankees could trade for some offensive help for Robinson Canó. Canó is doing his best this year, but his numbers are a bit down because opposing teams don’t really have to pitch to him. Why would they, when they can pitch to Zombie Vernon Wells after him? Rumor has it that the Yankees are looking for a third baseman right now, but I have an issue with this. As I just mentioned, they need serious help at four positions. Is trading for one guy going to be enough? No. Do they have enough talent in their minors to trade for someone at every position at which they need help? No. Even if they did, do we want to deplete the system of all of our prospects for barely a shot at making the playoffs? No. I just don’t think the Yankees can do enough damage on the trade market to make this a viable option. The Yankees need too much help. They’re better off trying to retool in the off-season. This brings us to option two. Yes, you are correct if you assumed the title of this section is a Rocky IV reference. We all remember when Duke was begging Rocky to end the exhibition match (that’s all it was supposed to be, after all) between Apollo Creed and “Death From Above” Ivan Drago. 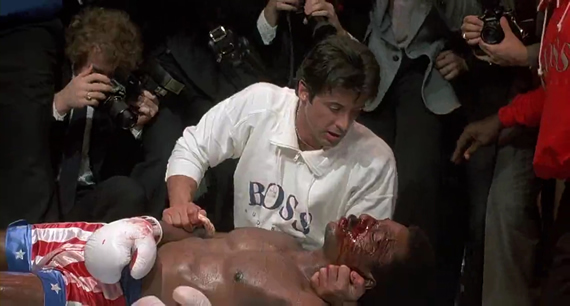 We all remember that Rocky refused to do so, choosing instead to honor his friend’s request to not stop the fight “no matter what.” We should also remember that Apollo Creed died shortly thereafter. This is what I want the Yankees to avoid during this trade deadline. As I said before, this team isn’t going anywhere. If they use their minor league system to trade for mediocre mid-season replacements, not only will their 2013 season die like Apollo Creed, some of the seasons to come might suffer the same fate as well. I think the Yankees are better off being sellers at the deadline. They need to start dumping the players that they know won’t be back next year and getting back whatever they can from other teams that actually have a chance to contend. Granted, the Yankees don’t have that much talent to deal from the major league team, but they have to get something back for those guys. I’m talking about Phil Hughes, Joba Chamberlain and Curtis Granderson, the team’s big impending free agents. At this point, I don’t think any of these guys are worth much on their own. Hughes has moments of brilliance, but then will also give up six or seven runs his next time out. There’s no consistency with him, so his value takes a hit, but you might be able to deal him to a national league team with a big ballpark that will be more accommodating to his fly ball tendencies. For that, I’m looking at teams like the San Francisco Giants. They still have Barry Zito in their rotation for Pete’s sake. Chamberlain, meanwhile, is worth maybe half a carton of cigarettes, unless they trade him to a prison, where he probably wouldn’t fetch more than a couple of “loosies.” Could he be any more useless right now? I think that, if the Yankees are going to unload Joba, it will have to be in a package with Hughes or our next trade candidate, Curtis Granderson. I feel bad for Curtis. He’s had one of the unluckiest seasons of any player in recent memory. He broke his forearm on the first pitch of Spring Training, and then broke his hand about a week after he finally made it back to the bigs. Because of his injuries, he hasn’t played. This will surely lessen his trade value, but if he can come back and hit a couple of homers before the break, he might fetch a couple of prospects or two from the right contender. He’s still the guy who hit 84 home runs the last two seasons. Seriously, would it be so bad for the Yankees to sell at the deadline? I seriously doubt they’ll be able to bring any of those guys back. In the case of Hughes and Chamberlain, I doubt they even want to bother. Hughes will get some team to pay him a lot of money this winter, just because pitching is scarce. Joba has proven to be a bit of a flop, not so much in talent, but in attitude and durability. They might be able to bring Granderson back on a lesser deal if his injuries continue to hold him back, but at 32 years old, he’s going to be looking for that last big contract, and I don’t think the Yankees should be the ones to give it to him. The Yankees should get what they can for the players they can trade and hit the off-season hard by either actually pulling out their checkbooks for some free real free agents (not the Hafners and Youkilises of the class), or using their prospects to make some trades in the more subdued off-season trade market. As hard as it is for me to admit this as a Yankees fan, hat’s what I think the Yankees should do. Tank the season and start again, for real this time, in the offseason. Will they actually do that? We’ll find out by the end of the month.